Ho... Ho... Ho... Don't worry our Childrens Christmas Party Games & Activities will keep your kids busy and happy. Also, have a look at our Kids Christmas Party Ideas and Christmas Crafts there you will find lots of good ideas. Last thing, if you know of any good Christmas games you would like to share with us and other parents, please feel free to Party It Forward. We and others will love to hear from you. It's nice when parents around the world contribute in helping other parents like you, to find FREE Christmas party games & activities. Now SCROLL down and have a look at our cool and fun Childrens Christmas Party Games & Activities. Pick the games which your kids like best, or which best fit the age group of your kids. Christmas Treasure Hunt: Hide small Christmas related items all over the party room before the party starts, let the kids find the treasures, give them 20 min. Give the more time if the kids are young. Pin The Nose on Rudolph: Similar to Pin the Tale on the Donkey. Make a big picture of Rudolph, tape it to a wall. Before the party prepare red circle noses for each player with their names on it, (to prevent confusion later). Have the players form a line and blindfold the player who has to pin the nose on Rudolph. The kid who places the nose closest to the correct place wins. Have a price ready! Christmas Charades: Lots of fun, let the kids act out the word you give them. Give the winner a small gift. Christmas Story: Great way to end a party, tell the kids a Christmas related story, about Jesus' birth, Santa Claus etc. Christmas Carol Contest: Lots of fun, who can name the most Christmas carols. Have a small present ready for the winner. Where is Santa: Have the kids sit in a large circle and blindfold one child. Another kid will be given a Santa hat, which he has to pass around fast. The kid who is blind folded has to say "Santa Santa, where are you", then the kid who is wearing the Santa Hat has to answer "I am here", he can try to change his voice. Then the blindfolded kid has to guess who is Santa, he can guess 2 times, if he doesn't guess right, he is out of the game. And the kid with the Santa hat has to be blindfolded, and the game starts again, until there is one player left, the winner. Santa Says: Similar to Simon Says. The birthday kid is "Santa". Santa will say "Santa says dance". The kids then have to dance. What ever Santa says the kids have to do, if he says "Santa says". If he doesn't say "Santa says..." that command is not valid. The kids who do follow that command are out of the game. The faster Santa commands, more difficult the game becomes. Santa Relay: Make two teams and two lines, there also has to be a starting point and a return point for the relay. The first team player to go has to dress up as Santa (have a big Santa outfit ready for each team) and then walk (the fastest) to the turning point, take the Santa outfit off and walk, not run back to it's team members. The team who finishes fastest, wins. Christmas Ten Questions: Similar to 20 questions. Let the kids sit in a circle, you have to think of a Christmas related person, thing, or place. You can start the game by giving the kids 2 clues. The kids have to guess what it is, and they can ask you 10 questions. You have to give them clues. When they ask questions you can answer "Yes", "No", "I DON’T KNOW". The kid who guesses correctly is next up. Christmas Chairs: Similar to Musical Chairs, but played with Christmas music. Christmas Colouring: Lots of fun for smaller kids, provide the kids with Christmas clip arts, and let them colour and decorate the clip art. Christmas Carols: Sing Christmas carols with the kids, it's fun and they maybe will learn a new carol. Santa Claus Piñata: End the party with a Santa, star or bell piñata. Lots of fun. Fill the piñata with small Christmas related items and candy. 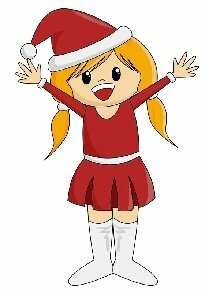 I hope you have enjoyed reading our childrens christmas party games & activities and I hope your kids will enjoy playing our childrens christmas party games!